Today had a little bit of everything - long hikes, drive ups, lands owned by timber, ranch and military interests, CC-listed summits, prominence summits, awesome views and no views at all. All of them were located in southern Mendocino County in the stretch of coast ranges between Hwy 1 and US101. Only one of the summits I intended to visit proved a failure, so overall it was a pretty good day. Red Rock BM is a P1K that lies on private forest lands in the southwestern part of the county about 5mi from the coast and the small town of Gualala. Much of the coastal area on either side of Hwy 1 appears to be owned by the sprawling development community known as Sea Ranch, a popular vacation spot. Some 2000 homes here are of a distinctive wood architecture, most often rented out as weekend vacation homes. Coastal access issues created when the development was initiated in the late 1960s led to the establishment of the California Coastal Commission. The surrounding upland forests, once home to enormous old-growth redwoods, have seen second-growth harvests to support the development. For an outdoor enthusiast, it's akin to stripping the Sistine Chapel of its artwork for display in strip malls. Red Rock BM and Little Red Rock Mtn are part of a large parcel of private timber lands. My start near where the North and South Forks of the Gualala River meet was the site of a major timber harvest sometime in the last 3-6yrs. The first several miles pass through this harvested landscape, a stark reminder that all that nice wood we have available to build our homes comes at a price. A locked gate at the bottom kept me from driving much further up the road, making this an outing of some 11mi, roundtrip. The old growth stumps, cut 50-100yrs ago were still quite evident, some as much as 8ft in diameter. Sprinkled around those were the more recent cuts, trees measuring but 3-4ft in diameter. I was surprised to see some of this timber lying on the ground in places, as though it had been forgotten when they were clearing out the harvest. After covering about 3mi of this over the course of the first hour, I eventually reached higher into the forest where the second growth has been left, as yet, uncut. The route I followed was a series of logging roads, old and new, that got me to the summit by the end of the second hour. The summit was devoid of views, but notably there were two old-growth stumps lying in the understory of the forest canopy at the very highest point. I had no luck finding the benchmark nor discovering the meaning of the USGS label "Old Red Rock Place" found on the topo map. Both remain a mystery. On my way back I made a side visit to Little Red Rock Mtn. It had some very old logging roads that made getting to the top off the main road not so bad. The summit featured some old, rusting weather instrumentation which from the looks of it is minimally maintained. Not so much excitement here, and though the summit areas was relatively clear, trees ringed the perimeter to block much of the views. The overcast skies and uniform look of the surrounding mountain forests suggested I probably didn't miss much. I was about 4mi down the road on my way back when I was confronted by a white pickup truck driving up the good logging road. Hoping for the same luck I had the previous day, I moved to the side and gave a small wave. The truck stopped, the window rolled down, and a portly gentleman about my age asked in a rather stern voice, "Can I help you?" He was not happy, that much was obvious. Knowing his question to be rhetorical, I offered weakly that I was on my way down. "Don't come back here again," was the reply. He asked if the car at the bottom was mine ("Yes, it is") and let me know he had recorded the license plate in case of any future violations. I asked if he had come up specifically to look for me but he admitted that he was coming up this way for other business. At least I didn't put him out that much. He continued up the road while I continued back down, happy that was the extent of my troubles. It was 11a by the time I got back to the gate and the van. Time now for the easy peaks. This CC-listed peak is found about 9mi northwest of Red Rock BM, alongside Fish Rock Rd. It has no redeeming features aside from its 800ft of prominence. The most interesting part was the drive to get there and the fascinating geography along this part of the coast. If one looks at a map, they will see that the Gualala and Garcia Rivers run for some 45mi parallel to the coast less than 4mi from the coast itself. This goes against all expectation one would have from understanding river valley and canyon formation. But this oddity was formed not through normal erosion, but by plate tectonics - the San Andreas Rift Zone runs along the length of the river channels from Fort Ross to Pt. Arena and it is here that the Pacific Plate is sheering sideways against the North American Plate. Between the coast and the river channels is a low ridge about 1,000ft in height along which runs the Old State Hwy before Hwy 1 was constructed along the coastline. I drove the Old State Hwy to Fish Rock Rd (named for a small community at the coast which in turn was named for Fish Rocks, a pair of large rock islands just offshore) then inland down 500ft to the saddle between the two river drainages before driving 4mi up to Gualala Mtn. The road follows the divide between the two river drainages, nearly going over Gualala Mtn. I parked off the side and hiked about 50ft up to the highpoint, difficult to locate on this rounded summit buried in forest and forest duff. It was a silly exercise in peakbagging. When the time comes I will be sure to excise this peak from the CC list. Back down to the Old State Hwy, I drove only half a mile north before stopping to investigate Peak 1,380ft. 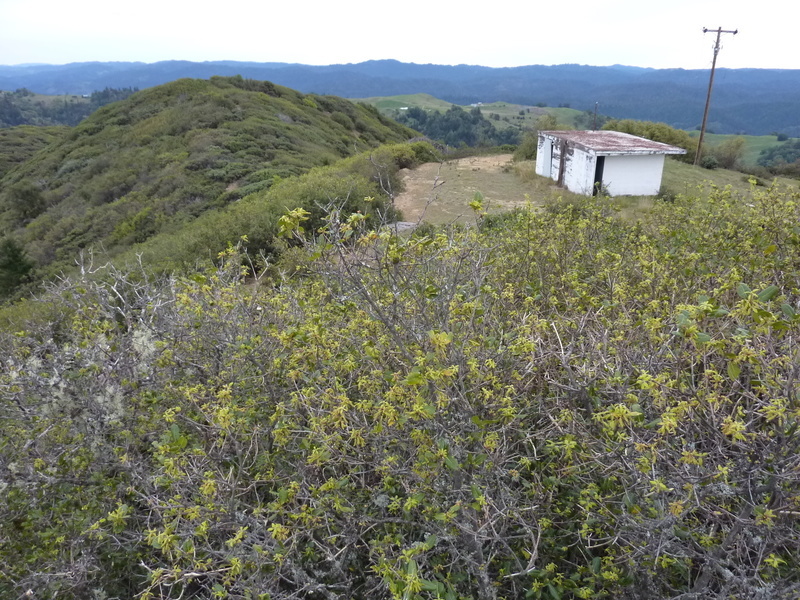 Though of a rather lowly stature, the summit is the highpoint of the narrow ridge between the Garcia/Gualala River drainages and the sea and features more than 900ft of prominence. Unfortunately its also pretty boring and appear to be where Roseman Creek Rd goes over a slight rise. Yay. In the words of Monty Python, Now for Something Completely Different. This P1K is home to the Point Arena Air Force Station, once used as a general surveillance radar station but closed in 1998. It was built as one of 28 such stations prompted by the Korean War and for more than 40yrs served a variety of purposes for the USAF. Since the closure the Air Force has tried to offload the site to another government agency or to a private buyer, but so far no one has been able to figure out what to do with it or the tons of asbestos that insulate most of the buildings there. A caretaker onsite keeps out the riffraff, but the buildings are in a slow state of decay that is unlikely to be reversed. My plan was to drive to the station, talk to the caretaker and see if I couldn't get permission to tour the place. It was a long shot, but I'd read of at least one successful endeavor by someone who's father had worked at the place in days gone by. I was happy to find the paved Eureka Hill Rd open all the way to the base at the top at nearly 2,400ft. In fact it was better than that - the gate to the perimeter fence was open though there were plenty of signs telling of ominous dangers for the uninvited. I drove in slowly looking around for signs of the caretaker. It was a ghostly quiet place. From what I could tell, all the buildings were one-story residences set in rows with cracked pavement and sidewalks, grassy turf kept short by grazing deer. An old playground had play structures of rusting metal that were popular when I was a kid in the 1960s. One of the buildings had a black pickup truck parked in front with the driver's side door open but no one visible. I continued driving around the corner to the far end where my van would be blocked from view. I got out and wandered into the woods at the south end of the development. An old road led to a radar installation that appears to be where the highpoint was indicated on the GPS. I was not going to play around on this piece of equipment with a caretaker around and beat a hasty retreat. The door of the truck was still open when I drove by a second time on my way out - seems he may have forgot he left the door open. The whole place had a Chernobyl-like spooky feel to it and I was not unhappy to be driving back down the road. I drove back down to the Garcia River, up and over the low ridge to Pt. Arena, across the Garcia River a second time, this time on Hwy 1, and finally inland on paved Mountain View Rd towards Boonville. This road connects the coast to Anderson Valley along a ridge separating the Garcia River drainage to the south from the Alder and Brush Creek drainages to the north. The highpoint along this route is found on Hanes Ridge whose summit, Buck Peak, is both a P900 and CC-listed. The route I had mapped out from Mountain View Rd was just over 2mi one way and seemed one of the more straightforward summits for the day. It was not. I found the start easily enough, an old gate across an old road that looked to not have been used in years - perfect, or so I thought. I didn't make it quite half a mile as I was just about to crest a grassy part of the ridge when I spied smoke ahead. I stopped. Someone was burning leaves or slash or something just above me. I heard no noises and couldn't tell if the fire was being tended, but it seemed most unwise to proceed. Even if no one was there, the chances were good that someone would come back to check on the fire at some point. I decided to beat a retreat and left quietly, figuring I'd come back another time. Back in the car, I drove another 5mi inland for Lambert Ridge. This P900 is on the north side of the road across from Bear Wallow Creek. My plan was to use a gravel/dirt road and bridge that crossed the creek and then an old jeep track running up the south side of the ridge. Right after I parked and was getting out to collect my gear, a truck drove out the open gate and then east towards Boonville, probably wondering what I was doing there on the opposite side of the road. After he went around the corner I went over to investigate the road. He had left the gate open with the lock dangling from a chain. This suggested he was just going to be gone a short time, perhaps a quick trip to Boonville for something. This, too, smelled of trouble and I turned back. Once again in the van, I consulted the GPS and noted another approach from the east, utilizing dirt Redwood Ridge Rd that starts at the highpoint where the pavement goes over a saddle between the Bear Wallow and Ornbaun Creek drainages. Though marked "private" on the topo map, the road is not gated and has half a dozen addresses listed on a sign at the pavement. I managed to drive a mile and a half on this not-so-bad road to get me within half a mile of the summit. I stopped when a sign indicated "Last safe turn-around before gate". I parked here and started up on foot. Halfway up a sign indicated the Mannix Ranch property boundary and I was no longer on a common road. Just past this I turned left where another sign indicated "Tanbark" and soon led to the summit area buried in a second growth redwood forest. The place was littered with all sorts of junk and trash from decades of use and abuse. Near as I could figure, the place must have been home to some sort of commune in the 1960s/70s or thereabouts. There were more than a dozen cars left abandoned, an equal number of trailers of all shapes and sizes, everything many decades old. A wooden building appears to have been the main house, its porch and exterior decorated in trashy decor. The windows were broken and the insides disheveled and left to deteriorate in the wet environment. An engine-less bus was in another area, set up for someone's living quarters. An elderly person's walker was left lying on one side, almost as if showing where the last old hippy keeled over and died. It was the second creepy place I had visited on the day, though far different from the first one. No caretaker here, by the way, though the signs I had followed did not look very old - someone probably lived somewhere nearby on the Mannix Ranch property. This CC-listed summit was easily the best summit of the day and also the longest at 7mi one-way. The peak is located about 5mi southeast of Anderson Valley and south of SR253. My starting point would be where SR253 crests a rise straddling the Russian and Navarro River drainages. It was 3:40p by the time I had driven Mountain View Rd into Boonville at the center of Anderson Valley and then east on SR253. A gate at the highway appears to be of more recent fabrication and the gravel/dirt road showed signs of regular and recent travel - it did not look good at the start. I left the van alongside the highway on the shoulder to the west and hopped over the fence when traffic was absent. I jogged about 100yds until I was in the woods and out of obvious view. Signs for the first mile and half indicate a hunting club owns the property immediately to the left (east) of the road and may use this road for access. As it was well outside deer hunting season I wasn't much worried - though I think pig season may be year-round. This good road runs on the east side of a north-south ridgeline under a forest canopy for about a mile and a half until it reaches a junction. The left fork is gated and runs downhill through the forest. It also takes all the traffic which was a good thing since my route followed the ridge on the right fork. The road becomes grassy with downfall and other evidence that the road is lightly, if at all, used. My anxiety dropped to almost nothing as I found myself no longer worrying about confronting an upset rancher. Though overcast, the scenery was fine with grassy meadows and hillsides intermixed with pine and redwood forests. At the 3mi mark I crossed a property boundary but the roads I followed beyond it were also infrequently traveled. A passel of three feral pigs were startled out of their rooting exercise when I came around a corner and took off in the opposite direction. One paused to stare me down for a moment but then went off with the others. At 5.5mi I passed through an older property boundary, no longer gated. Now 5:30p, I could finally see Grizzly Peak less than 10min away. At the top I found an old line shack fallen into disrepair. Power lines ran up to it from the west and down the south side. The summit area was free of trees and open to views in all directions, one of the few places I've enjoyed such vistas in this part of the coast ranges. The highpoint is found behind the shack to the north a short distance hidden in a thick wall of brush. I poked around in here a few minutes before discovering a set of summit rocks hiding in the brush. The highest of these requires a tough but short push through the brush followed by a class 4 mantle move to surmount it. This was quite a surprise and I laughed at the tough little nature of it. It seemed a worthy peak, one of the few in this vast tract of hills, so I scrounged around in my pack for the makings of a summit register. A rusty tin, an empty soda can, a tiny pencil and a supermarket coupon were assembled and left on the summit rock - a treat for its next visitor which almost certainly would have to be someone who's read this report - finding the register by accident would be highly improbable. Bob, you have encountered more creepy abandoned forest dwellings than the average Californian. That would make for an interesting website in and of itself.